(Salt Lake City) Backyard bird owners are advised to take steps to protect their flock from the highly infectious avian influenza or “bird flu.” Highly pathogenic avian influenza (HPAI) was recently detected in waterfowl in Utah prompting state and federal veterinarians to reach out to domestic and commercial poultry owners to increase safety measures for their flocks. HPAI spreads rapidly and has a high death rate in birds. The discovery of HPAI in Utah poses a threat to the state’s $150 million dollar turkey, egg and chicken industry. 1. Keep your distance. Restrict access to your property and your birds. If visitors have birds of their own, do not let them near your birds. Your birds should not have contact with wild birds and migratory waterfowl because they can carry germs and diseases. 2. Keep it clean. Wash your hands thoroughly before and after working with your birds. Wear clean clothes and scrub your shoes with disinfectant. Clean and disinfect equipment, including cages and tools, that comes in contact with your birds or their droppings. Remove manure before disinfecting equipment. Properly dispose of dead birds. 3. Don’t haul disease home. Buy birds from reputable sources so you know you’re getting healthy birds. Keep new birds separate from the rest of your flock for at least 30 days. If your birds have been to a fair or exhibition, keep them separated from your flock for 2 weeks after the event. 4. Don’t borrow disease from your neighbors. Do not share garden equipment or poultry supplies with your neighbors or other bird owners. If you do bring these items home, clean and disinfect them before they reach your property. 5. Know the warning signs. Early detection can help prevent the spread of disease. While it may be hard to tell if your bird has AI, when you check your birds frequently, you may be able to tell if something is wrong. 6. Report sick birds. Don’t wait. If your birds are sick or dying, call UDAF at (801) 538-7161. For dead wild birds, call USDA toll free at 1-866-536-7593. No human cases of avian influenza have been detected in the United States, Canada, or internationally, and there continues to be no public health concern. High Pathogenic Avian Influenza was recently found in wild or domestic birds in Washington, Oregon, California, Idaho, and now Utah. The virus was also detected in a commercial turkey farm in California. The avian influenza strains involved have not been implicated in any human infection to date. The USDA states that all poultry, poultry products and wild birds are safe to eat as long as they are properly handled and cooked to a temperature of 165 degrees Fahrenheit . HPAI viruses are considered foreign to the United States because they do not occur naturally here. HPAI has been detected and eradicated three times: in 1924, 1983, and 2004. The 1983 outbreak resulted in the deaths of about 17 million chickens, turkeys, and guinea fowl in Pennsylvania and Virginia. Managing this outbreak cost nearly $65 million and caused retail egg prices to increase by more than 30 percent. The UDAF is distributing bird safety information brochures to area feed stores. 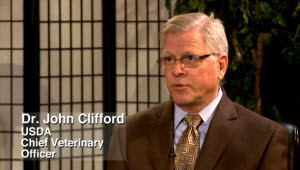 Utah State University is offering an online webinar for backyard poultry owners on the subject of avian influenza awareness. To join the meeting, connect at: https://connect.usu.edu/avianflu/ on Wednesday, February 25, 2015 from 12:00 – 1:00 p.m.